Tracing where a recipe came from can be tedious and sometimes awkward research; and sometimes you cannot even tell where the absolute origination began. It appears that Claudia Roden, who I have long turned to as an expert in Middle Eastern foods and recipes, brought this recipe to light many moons ago. Nigella Lawson has published a version as have the New York Times, Fine Cooking and The James Beard Foundation, members of the Food 52 community and others. Obviously this is a well-loved cake and with good reason. 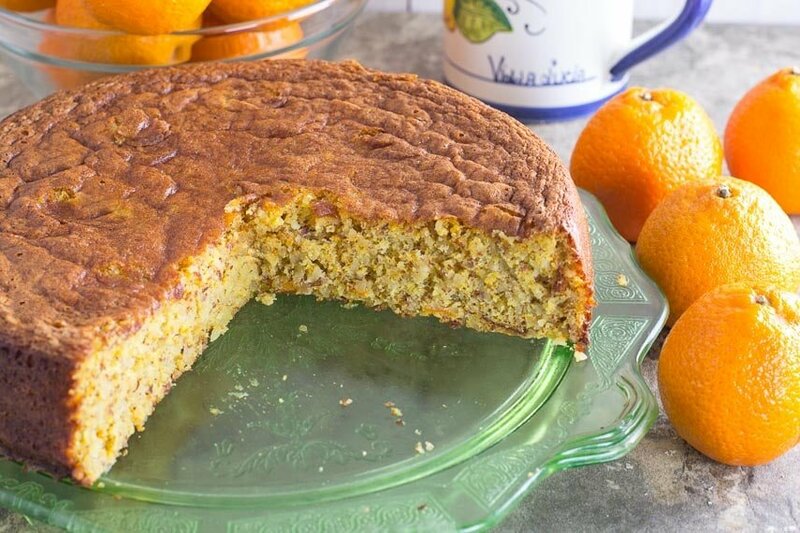 The cake combines whole oranges or clementines (that are poached in water until soft), ground almonds, eggs, sugar and baking powder. That’s it. No butter, no creaming techniques like you might with a layer cake. These few ingredients allow each one to truly shine. 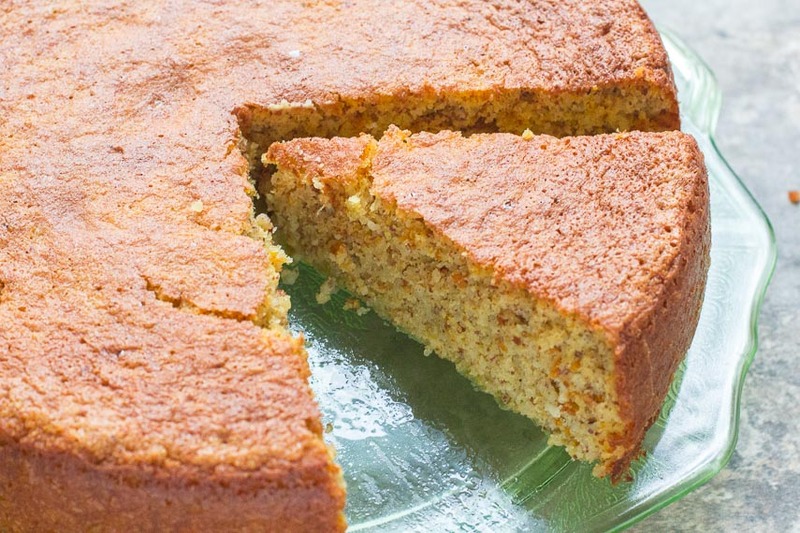 You taste the citrus and you taste the almonds and the simple, one-layer cake needs nothing. No frosting, no dusting of confectioners’ sugar (unless you want it) and it actually improves upon sitting. 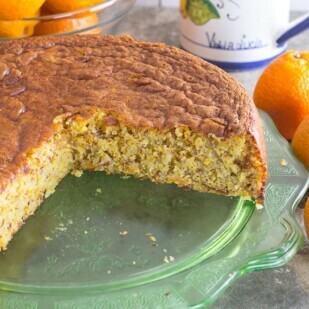 I like this cake on days 2 and 3 the best, making it a perfect cake to make ahead for a brunch or to accompany tea or coffee. And the cake is naturally gluten-free and dairy-free! You Want Me To Eat The Whole Fruit? Yes! The clementines are simmered with water for an hour and get all soft, tender and luscious. We recommend that you buy organic fruit if possible, since you will be eating the rind. Many (all?) of the recipes that I have researched for this cake suggested simmering the citrus for hours. I did that at first and it was fine. Then I got bold and tried simmering for just 1 hour and the results were great! You can shave off that time, no problem. Almonds appear to be a confusing FODMAP food for people. I believe this is because they will be listed on one resource as high FODMAP and on other lists as low. Of course you are confused! Here’s the deal. They are both. It has to do with serving size. Up to 12 g, which is about 10 whole almonds, are given the Green Light by Monash University. Luckily, since we have the Green Light weight amount, we can translate what that means for ground almonds. 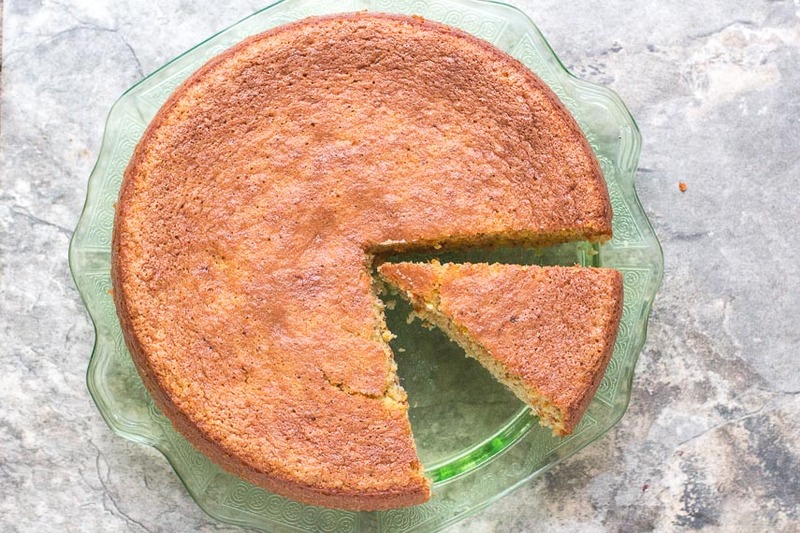 Pay attention to the serving size for this cake and you will be fine, unless you know you do well with Oligos (GOS), in which case you can eat a more generous serving as shown. The batter is quite liquidy and you will think you did something wrong. You didn’t! Bake it and at least see it through. For another version, try our Lemon Almond Cake. If you are a lemon fan, that one is for you! And if you are looking for flourless cakes in general, check out our Flourless Chocolate Cake and Heart of Gold Flourless Chocolate Cake. A Note From Robin – aka Official Recipe Taste Tester and Leftover Recipient: When Dédé brought this over for me to try I ate some before she told me what was in it. And my first reaction was WOW!! That cake is amazing! It’s so moist… and a bit nutty in texture. And OMG… what depth to the flavor. Then she told me what the ingredients were. I was so intrigued. And then I kept eating it. I had a few bites each day – for almost a week. And it remained moist and delicious. Definitely a winner! 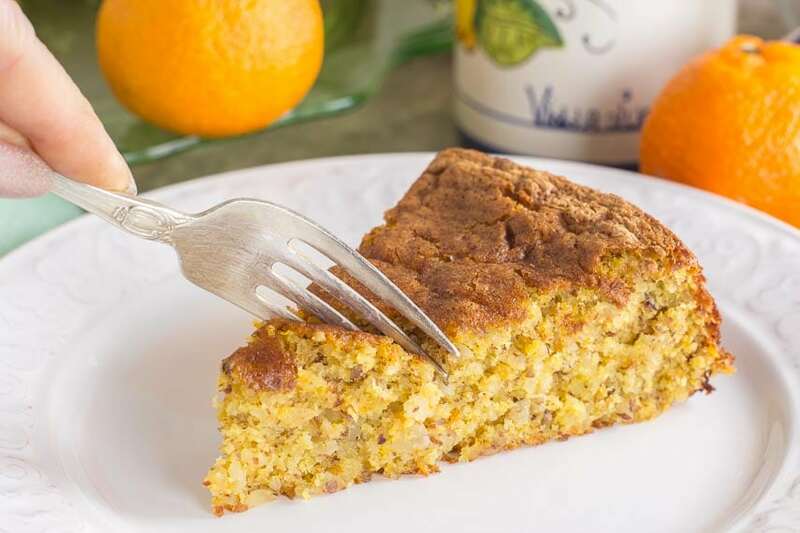 You will not believe how easy this cake is: it combines whole clementines, sugar, eggs and ground almonds for an unusual and sophisticated treat that is low FODMAP in small servings. Place clementines in a pot and cover with cold water by an inch (2.5 cm). Cover and bring to a boil, adjust heat and simmer for 1 hour. Keep covered, turn off heat and allow to cool for about 30 minutes. Position rack in middle of oven. Preheat oven to 375°F/190°C. Coat the inside of a 9-inch (23 cm) springform pan with nonstick spray; set aside. Meanwhile, pulverize the almonds in a food processor fitted with a metal blade. I pulse on and off, then let the machine run until you have ground the almonds very fine, but not until they get powdery. They should still have a little texture, but not much. Transfer the ground almonds to a small bowl; carefully wipe out the food processor with a paper towel and reassemble with metal blade. Pluck clementines out of their cooking liquid and transfer to a cutting board. Slice them into quarters and pick out any seeds (see Tips). Dump clementines and any juices into re-assembled food processor and pulse on and off, then process until a thick paste/purée forms; set aside. Beat eggs and sugar together with an electric mixer on high speed until they are thick and a ribbon forms when you drizzle the mixture back on itself. Fold in the ground almonds and baking powder until almost completely blended, then add clementine purée and fold in until everything is well combined. Scrape batter into prepared pan. Bake for 20 minutes, cover top with foil, turn oven down to 350°F/180°C, and continue baking for about 40 minutes more or until a toothpick tests clean when inserted in the center. Cool pan on rack or about 20 minutes, then run an icing spatula between cake and pan, then release springform and remove outer ring. Allow cake to cool completely. Cake can be served the day it is made but we think it improves after a day or two. Wrap cooled cake in plastic wrap and store at room temperature until needed. Serve cake as is, or with a few berries on the side. You could use blanched (peeled) sliced almonds, but they are usually more expensive. The cake will be lighter in color if you do because the almond skins will not be present. I often place the whole clementines right into the food processor. I get lazy and don’t bother to remove the seeds and the end result works for me. I tried this because I make a raw cranberry orange relish that uses whole raw oranges and I never had an issue with the seeds. Try either way and make a decision based on your own palate. This sounds like a wonderful recipe for FOPMAPERS and NonMAPERS. Can almond flour be used instead of toasted almonds? You could but here is why I didn’t go that route: almond flours and almond meals vary hugely in texture from brand to brand and most are “raw” not toasted. If you want to try almond meal, look for one that is made from whole, natural almonds (skin on) not blanched almonds. You should be able to see little flecks of brown skin – and make sure it has some texture to it and is not “fine” and powdery. Yes! Their product is the right consistency. It’s funny because in other recipes I found it too dry, but it is perfect for this cake. Thank you for being patient. The wait will be worth it! How much flour do you use when using the Trader Joe’s brand? Hi KE, you would use the same weight as the almonds – 258 g.
Soo… According to my math, 1/20th of the cake is a low FODMAP serving. I’ll have to make it for a potluck so i don’t eat a quarter of it! Yes a small slice BUT here is what we suggest you try. That amount is low FODMAP but that doesn’t necessarily mean you cannot eat more. Only you will know by testing it. Start small. I can eat a larger amount if I am eating pretty low FODMAP the rest of the day. This is why the FODMAP diet is like a living breathing thing…it evolves…you evolve with it. Also, just because you can’t tolerate more today doesn’t mean you might not 6 months from now! Be kind to yourself, keep portions small at first and keep trying! And besides, this is one kind of tasty test to take isn’t it?